Looking for a fun way to keep your kids active this summer? Beat the heat with CKK for strength training, sports drills, kickboxing, hip hop dance and more! 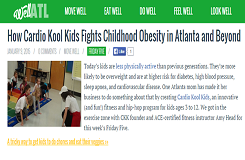 Cardio Kool Kids is a complete wellness curriculum for children that innovatively combines sports, dance, and health education. Our program benefits the whole child, features positive reinforcement, provides student leadership opportunities, and teaches kids that healthy living can be fun! I hereby agree to release and hold harmless Iron Tribe Fitness, its employees and representatives and Cardio Kool Kids, its employees and representatives, from any responsibility, loss, liability, damage or costs which Participant may incur in this program whether caused by the negligence of Iron Tribe Fitness and/or Cardio Kool Kids, the negligence of Participant and/or others, or due to accidental occurrences. In the case of injury or medical emergency involving Participant, if a parent or guardian cannot be reached, I give the Cardio Kool Kids program representative(s) permission to seek appropriate first aid or medical care and I agree to be fully responsible for the cost of any services provided. Cardio Kool Kids classes and special events provide photo/multi-media opportunities to recognize students’ accomplishments and activities. Cardio Kool Kids occasionally uses these media images for promoting the program in publications and websites. If you do NOT want your child’s image to be used, please check the box below. Parent/Guardian Name Electronic Signature * I agree to be legally bound by this digital signature.